The so-called far right is ascendant nearly everywhere in Europe. Sunday a week ago, the French government sponsored a solidarity rally featuring an array of foreign leaders and all domestic political parties joining together in a "sacred union" (a term recalling World War I) against the massacres at Charlie Hebdo magazine and the kosher market. Make that all the political parties except one -- the National Front (NF) headed by Marine Le Pen, ostensibly excluded because it does not subscribe to "republican values." In reality, it was barred because, uniquely among French political parties, it opposes immigration; and other politicians fear that the NF gains in the aftermath of the massacres. Likewise, the government yesterday forbade a demonstration by the secularist Riposte Laïque organization that called for "Islamists out." . The NF and similar parties represent the healthy, normal, legitimate, and constructive response of a people under stress. Granted, some European parties actually have a fascistic quality, in particular Golden Dawn in Greece and Jobbik in Hungary. But the others being maligned are in fact populist and insurgent, often with leftist economic programs, especially concerning the welfare state. They are creatively centrist, forming a novel combination that draws on right and left in both their policies and their supporters. They represent the healthy, normal, legitimate, and constructive response of a people under stress. Moreover, they address what's on many minds. 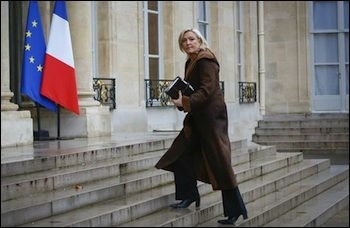 The Paris attacks got Marine le Pen invited to meet the French president, but not to march in his parade. In addition to the NF in France, similar parties include the United Kingdom Independence Party, the Swiss People's Party, the Freedom Party of Austria, Alternative for Germany, the Danish People's Party, the Progress Party (Norway), the Sweden Democrats, the Finns Party, and – leading the pack – the Party for Freedom (Netherlands), founded by Geert Wilders, whom I consider to be Europe's most important politician. Two concerns top their agendas: the European Union and Islamism. 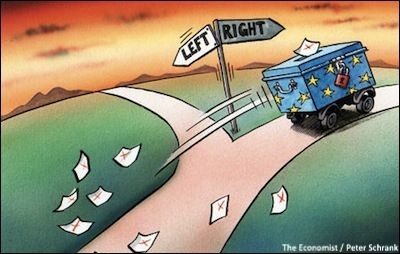 The EU arouses negative responses for a variety of reasons – the British want out, the Germans want to spend less on others, the Greeks want less austerity: all feel oppressed by the supra-national experiment that began modestly in 1951 as the European Coal and Steel Community. Only EU bureaucrats and the well-off, buffered from the realities of everyday life, argue that things are just fine. On Islamism, the response across Europe is unified. From Spain to Norway, one hears about too many immigrants, too much accommodation, too many social pathologies, too much Islamic supremacism, too much Shari'a (Islamic law), and too much violence. Increasing numbers of Europeans fear Islamism, grieve the loss of their traditional culture, and worry about their children's future. Legacy parties, the media, and academics engage in a campaign of denigration, marginalization, and ostracism against populist parties. Legacy parties, the media, and academics engage in a campaign of denigration, marginalization, and ostracism against these parties to place them beyond the pale, as though they were the new Nazis. This is dangerous and futile. Dangerous because, denied acceptability and deference, members of these parties will be more likely to express themselves through extremism and violence. Futile because the numbers in this legion are inexorably on the rise. For example, the Sweden Democrats have doubled their support in each of the past four elections. Survey research finds Le Pen and Wilders leading the polls in their respective countries. As they continue to gain new adherents, many will before long have an important voice in European countries. Rather than engage in name-calling and attempts at exclusion, established institutions should encourage the populist parties to moderate, become more sophisticated, and fully participate in the political process. Although these tend to be undisciplined, with some paranoid and unacceptable elements, they're learning as they go, erratically becoming more reputable. Yes, many of them have dubious backgrounds – but so too do long-established parties in countries such as France, Germany, and Sweden. Whether welcome or not, the insurgents are coming. The future will be better for all concerned if they assume their expected role with the establishment's cooperation, not vilification. They deserve courtesy and respect.